My FIRST Give-A-way–I reached 100 Facebook Fans | Who Are You Calling Crafty? and since that seems like such a pain in the behind. I figured I would just do it on my blog. 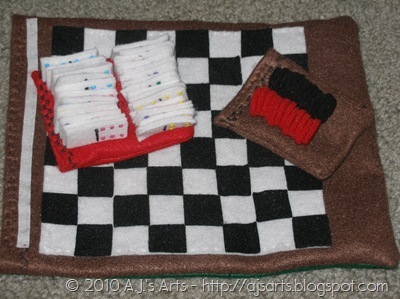 Travel Checkers and Dominoes Set – Please note the color might be red and not white and the dominoes have a grey back and it is a tie closer. The Travel Set have “improved” over the most recent making. I just haven’t taken new pictures – lol. 4. Join me on The Hive (Entry 4 – I will check once again ) Note it in the comment section. I will ship to Canada for all my Canadian Followers but I will not ship Over-Seas because it is Christmas Time (sorry). The contest will be open until December 5th I will draw a number through Random.org on Monday, December 7th.